SS 350 | Just Shooting Memories! I was having trouble deciding what to post tonight when I realized it has been a while since I posted a photo of a classic car. Now, don’t get me wrong, after a four hour round trip hike to the top of Blood Mountain Georgia this morning, I was all for posting at least a teaser photo of the absolutely amazing sunrise, I decided to postpone it. Getting up at 0230, leaving at 0300, arriving at the trail head at 0500 and making it to the top of the mountain by 0605 has taken it’s toll on me. Not to mention the hike back down the mountain and then the drive home. 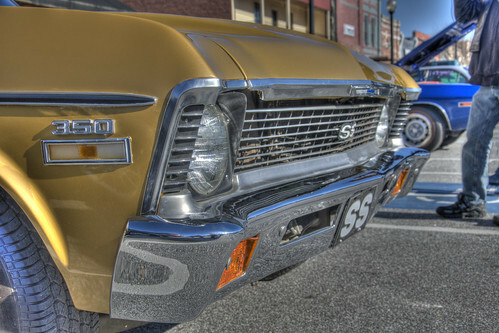 This is another photo from one of our local classic car shows. I heard of another one which was today, but decided after the excitement this morning, I would take it easy the rest of the day. Of course, that is relative to the definition of easy. When someone comes up with a good relative definition explanation, let me know.